"A Bit of a Do II"
After 11 years at the Jinnie Inn in Rolleston, Phil and Dianne Humphries said farewell by inviting St Mary's Church to come and empty the whisky bottle on the bar. 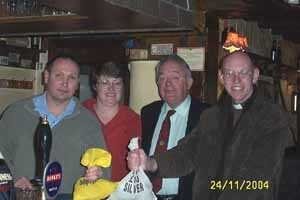 The loose change that had accumulated was donated to St Mary's ACCESS project. On his last day at the Jinnie, Phil handed over £50 to the Rector, Ian Whitehead and his wife, Christine, and Jinnie regular Ivor Bailey. Stretton Theatre and Revue Society (STARS) joined with the Waterside Players to put on an evening of "mirth, music and merriment" in Rolleston Scout Headquarters on Saturday 13 November, where they entertained a large audience as part of the latest event organised by the Rolleston on Dove Special Events Committee (RODSEC). The show, called "A Bit of a Do II", provided the first opportunity for the two dramatic societies to work together, and they will again co-operate in a show called "Arabian Knights - El Panto" at Waterside School in Stapenhill from 2nd to 5th February. On 11 November, sixty five people gathered at the Lych Gate of St Mary's Church in Rolleston on Dove for the annual Act of Remembrance, led by the Rector, Rev. Ian Whitehead, who read the names of Rolleston men and women who died for their country in the two World Wars. The Royal British Legion Standard Bearer was Joan Chadfield, and the bugler was Michael Marrison. The Kohima epitaph was read by Mrs. Sybil Limbert. The carved oak panels on the eastern side of the Lych Gate had recently been replaced by Rolleston Parish Council as part of an ongoing programme of restoration. The Lych Gate was built as a war memorial by public subscription after the Armistice of 1918. Sir Oswald Mosley, the father of the Fascist, made a generous donation, and also gave seasoned oak from his Rolleston estate for its construction. It was completed in time for the first Anniversary of the Armistice on 11 November 1919. Rollestonians were shocked when John Haynes announced the closure of the village Post Office, but were delighted when it was reopened a few days later (13th September) at the other end of Burnside by our popular newsagent, Tom Starbuck. After extensive refurbishment, the new Post Office which forms one end of Starbuck News, offers exactly the same range of services. The Post Office hours will be Mon – Fri, 9 – 5.30, Saturday 9 – 12.30. Tom is the son of Patsy and Andy Starbuck, who had already extended the newsagent's business to include a wide and sometimes eclectic range of goods and services. They are also an invaluable source of local information. Tom, who is a keen sportsman, still finds time to play golf and five-a-side football. His wife Becky, a science teacher at the John Taylor High School in Barton-under-Needwood, has developed a talent for producing personalised greeting cards. The picture shows Tom Starbuck (the Post Master) behind the counter of Rolleston's new Post Office. Rolleston on Dove has been donated a valuable and interesting piece of local postal history, for the village archive, by Mr Christopher Rolleston Riding, a philatelist. This is a one penny “Mulready” letter sheet, dated 15th May 1840 and addressed to Mr Atkinson, Gardiner(sic), Rolleston Hall, Burton on Trent. On Friday 9 July St Mary's Church resounded to the music of four different groups to celebrate the 21st anniversary of Burton's twinning with Lingen, and the 40th anniversary of Rolleston Choral Society. The Lingener Mannerquartett (LMQ) sang a wide range of religious and secular songs in several languages, and Rolleston Choral Society performed a variety of items, including a magnificent rendering of the Allelujah Chorus. The choirs were supported by "Voce" from De Ferrers Specialist Technology College and by "Beyne Upbeat", a jazz band from the Abbot Beyne High School. 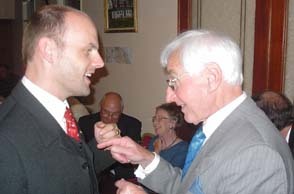 After the concert, the Lingen and Rolleston choirs gathered at Rolleston Cricket Club for an informal social evening, during which County Councillor Frank Bather presented a Stafford Knot lapel badge to the LMQ Musical Director, Eric Even (pictured). The LMQ was founded in 1952 as a double quartet of eight voices, but now numbers thirty singers. They have performed all over the world and celebrated their 50th anniversary in 2002 with a four day festival in Lingen at which eight choirs with 450 singers sang to large audiences. On the morning of Saturday 10 July, from 11 am, the Rolleston and Lingen choirs gave informal performances in Burton's three main shopping centres: Burton Place, Cooper's Square and The Octagon. The climax of the festival was at 7pm at Burton Town Hall, with a concert given by Rolleston Choral Society, the Lingener Mannerquartett, the Needwood Singers and the Gresley Male Voice Choir. This was a unique occasion for East Staffordshire, and an event to remember. On Saturday 19 June in anticipation of the Day of Traditional English Events to be held in Rolleston on Dove on 3 July, the Trustees of the Almshouses cleared the garden between the Almshouses wall and the Alderbrook and planted over 500 bedding plants. A group of Rollestonians also took part in a general "village cleanup", organised by Parish Clerk Michelle Willetts, concentrating on the Croft and the Alderbrook. Another group concentrated on getting the churchyard to look at its best for the event. 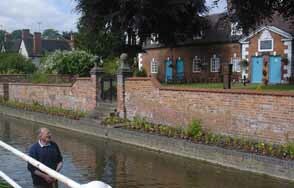 The pump outside the Almshouses will be the site of Rolleston's first well dressing, and on the brook there will be the "Alderbrook Armada", a flotilla of small boats made by John Underhill and sponsored and decorated by village organisations. The picture shows Almshouses Trustee, Tom Martin, weeding the Alderbrook in front of the Almshouses. Churches across Britain are rescheduling their services and even screening live football matches in an attempt to bolster attendances during the month-long Euro 2004 championships. Dozens of churches are planning to embrace the fervour surrounding tonight's (13 June) England v France clash in an attempt to keep up their congregation numbers. Many vicars admit that they have been lobbied by their congregations to ensure that there is no clash between traditional evensong services and the big game. The Rev Ian Whitehead, the rector of St Mary's Church in Rolleston-on-Dove in Staffordshire, said: "I've been petitioned by the choir to choose the shortest hymns I can and also the shortest psalm. I've chosen Psalm 117 which only has two verses and I will probably make some reference to the England-France game in my sermon. The service runs from 6.30pm to 7.30pm, so it will be a tight rush for the choristers." On Saturday 31 January one hundred and forty people turned out on a very wet evening to listen to a 'lively' talk by Elizabeth I. This joint event organised by RODSEC and Rolleston on Dove WI also included a wonderful supper of soups and puddings after the talk. Read more here.